Minimoog filter research « Adafruit Industries – Makers, hackers, artists, designers and engineers! 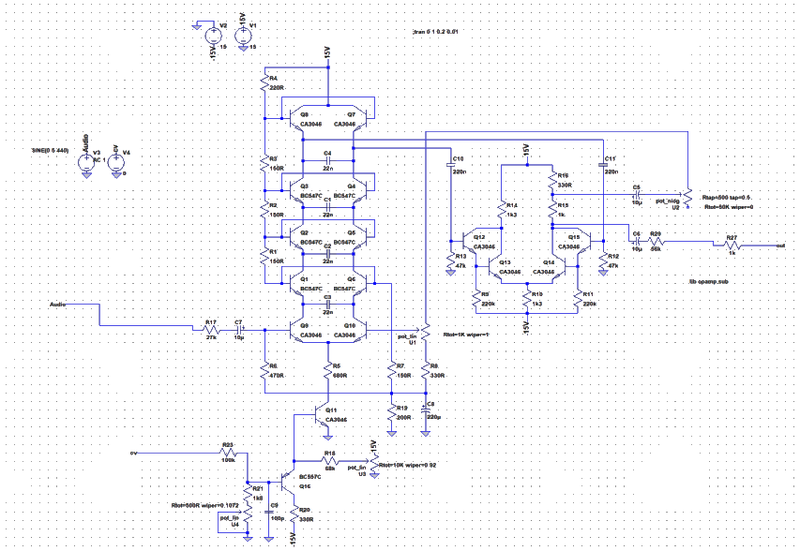 I’m trying to figure out a bit more about the minimoog filter, to be able to use it in my XM8. I’ve started by simulating a circuit. I first drew up the Yusynth version, but thought the results were a bit odd so I switched to the Schmitzbits one. I later realised that I probably should have used a 0-10V CV with the Yusynth one to cover the full frequency range, this worked well with the Schmitzbits one. I was curious what would happen if I changed the cap values from Schmitz to Yusynth, i.e. 22nF to 47nF. 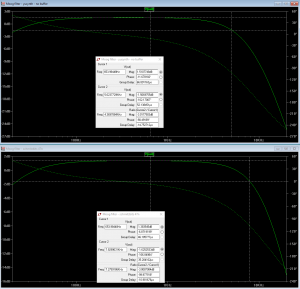 Turns out that by doubling the capacitance, you also double the amount of current needed per Hz. Not really that surprising when you think of it at it takes twice the current to charge the cap with the same speed. In practice, this means that by doubling the capacitance, but leaving the rest of the circuit – including the control voltage – the same, the cutoff frequency will drop by one octave. In general, increasing or decreasing a capacitor value will change the absolute cutoff value a certain control current will result in. But it probably still holds true that doubling the current will double the frequency and thus give a cutoff one octave up. I assume the same is true for changing the resistors between the steps in the ladder.